Google Play Store is the biggest application market available online for Android user base. It is among those few apps that comes preinstalled on your Android. 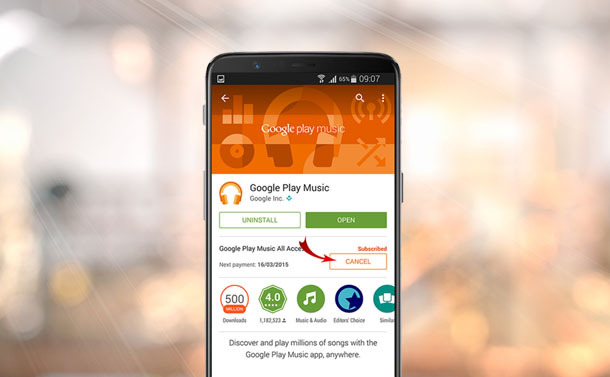 With myriads of applications and e-books, Google Play Store is also one of the top launched applications on your Android. Apart from the free apps, there’re many apps that provide you with some out of the way services and charge some amount against it. Where some apps charge you once in for all, some apps charge you monthly or quarterly based on the plans they are offering. These scheduled payments make a subscription. Tap on the menu button on the left-hand side top corner and select Subscription from the list of menu. Now select the subscription that you want to cancel. Tap the Cancel subscription and follow the screen based instructions. As Google Play Store isn’t available as an application on iPhone and iPad, you must launch it on a web browser. Upon launching, you may proceed with the simple steps as you would follow on a desktop. Launch any web browser (Google Chrome or Safari etc.) on your device. Click on My subscriptions from the left menu. Look for the subscription that you wish to cancel and click Manage. Proceed by clicking Cancel subscription. Launch any web browser and proceed to play.google.com. Click on My subscriptions from the menu located in the left side of the screen. Find the subscription that you wish to cancel and click on Manage. Proceed to click Cancel Subscription. It is important to know that even if you cancel, you would still have access to your subscription for the remainder of time for which you would have already paid. For example, if you sign up for an app or service on Jan 1 for $20 for a year and you decide to cancel the subscription on July 1, you would still have access to your subscription till Dec 31. Overall, cancelling a subscription on Google Play Store doesn’t require you to be a tech savvy. You may follow the above steps to cancel your subscription for any app that you don’t wish to use anymore. It is important to know that cancelling a subscription would stop future payments to be charged, but you the paid payments cannot be refunded. It is always better to cancel a subscription before the due date falls.